Santa Cruz de la Palma passenger and car ferry ticket prices, timetables, ticket reservations and information for ferries sailing from Santa Cruz de la Palma to Las Palmas and Tenerife. Compare all available Santa Cruz de la Palma ferry ticket prices in real time and book the cheapest available Santa Cruz de la Palma car and passenger ferry tickets sailing to and from Santa Cruz de la Palma, Las Palmas and Tenerife with Acciona Ferry Line ferries online with instant confirmation. 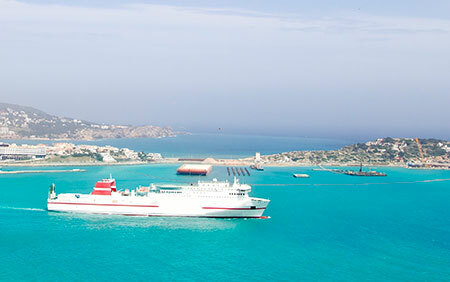 Book Santa Cruz de la Palma Ferry Tickets with Acciona Ferry Line for ferries sailing from Santa Cruz de la Palma to Las Palmas and Tenerife online in advance to enjoy the cheapest available ferry ticket price. The price you see is the price you pay. There are no hidden extras or surprises such as added fuel surcharges or booking fees and we do not charge you anything extra for paying with a Visa Electron card. The price we quote you for your selected Santa Cruz de la Palma passenger or car ferry ticket, onboard accommodation and vehicle type is all you will pay, and that's a promise. To obtain a Santa Cruz de la Palma ferry ticket price and book your ferry ticket securely online please use the real time ferry booking form on the left. You are also able to add a hotel at your destination, or anywhere else, to your ferry ticket when completing your ferry ticket reservation. The capital of La Palma, Santa Cruz is a pleasant, small, historic city with many interesting old Colonial buildings with their typical Canarian balconies, attractive little squares, museums, street market and a seafront promenade. There is no purpose-built tourist accommodation in Santa Cruz (this can be found at nearby Los Cancajos) but there is a variety of shops and restaurants. Passengers on board the many ferry cruise ships which dock in the port of Santa Cruz can easily stroll into the centre of the town which just across the road from the harbour entrance. Santa Cruz de La Palma is a beautiful city with a colonial air which retains in its historic quarter, declared an Historic-Artistic Site, numerous palaces, colonial buildings and houses built in the traditional Canary style. Nor should we forget its churches and the Sanctuary of the Virgen de las Nieves, the setting for a century old tradition: the descent of the patron saint of the island. The enormously varied landscape housed by what is known as the “pretty island” is accessible from the capital of the island. For some of the best specialist clothing shopping on the Canaries you'll be hard pushed to find better than Santa Cruz de la Palma. What's more, it's a pleasure to stroll around this historical gem of a capital. Wander down Cally O'Daly, so named after an Irish merchant based here and find delectable shops in old Canarian balconied buildings. Pause at the various plazas, some with ancient churches, and others with mammoth ship recreations housing a military museum. Santa Cruz de la Palma is most certainly one of the most prettiest and aesthetically pleasing capitals to be found on the Canary Islands! If you're looking to be based at the historical centre of La Palma then Santa Cruz de la Palma is for you! An authentic natural paradise which offers the possibility of practising hiking among volcanoes and laurisilva woodland in any of its protected areas, among which stands out the Parque Nacional de Caldera de Taburiente. Make sure you see the Plaza España and stick your nose inside the town hall, which was the first in Spain to have an elected council. Historical sights and museums in Santa Cruz de La Palma include the Museo Naval housed in a reconstructed ship which looms adjacent to Plaza Alameda (a pretty plaza lined with cafes and bars) to great kitsch effect. It's known as the El Barco de la Virgen or the Virgin's boat and well worth a look for exploring the important history of Santa Cruz's port and the town. Nearby on the seafront is the now rather crammed in looking Castillo de Santa Catalina - a fort dating from the 17th century used as a defence against invading pirates. The Plaza Alemeda is a nice spot for a coffee with fountains and statues, and at one end, a scale replica of Columbus's ship, the Santa Maria. Inside the ship there's a naval museum, full of things like old charts and figureheads, but the best bit is the ship itself. There's something about the canons on deck that makes you want to play pirates, even if you're a respectable, middle-aged travel writer. Nearby, in the Plaza San Francisco, stands an old convent which now houses the island's museum -- great if you get a wet day. It's like a mad cross between a lumber hole and gallery – Renaissance paintings, old shipbuilding tools, looms, stuffed birds and turtles, and a row of sharks heads with serious teeth. 3 km above the town (within walking distance if you're fit, and a bus-ride if you're not) lies the hamlet of Las Nieves, with the most stunning chapel on the island – and believe me, La Palma specializes in beautiful old churches. This one is 500 years old, and the statue of the Virgin Mary is terracotta, and even older. Cop a load of that ceiling and altarpiece! Once every 5 years, they take the statue down to Santa Cruz for a major festival. The next one is 2015. The restaurant in the square has a limited menu, cooked really well. It's mostly grilled meat and salad, with chips or wrinkly potatoes. A mile or so down the road, Chipi Chipi has a similar menu, with more interesting decor (by a local artist) and cheaper prices. Good places to eat in the town itself, include La Lonja, La Placeta (on the Calle Real) and La Ola and El Picalo (on the sea front). There are plenty of bars too, with La Cuatro and Rocke's being particularly popular. Best Price Guarantee - We always offer you our lowest available Acciona Ferry Line passenger and car ferries ticket price to and from Santa Cruz de la Palma. There are no hidden extras or surprises such as added fuel surcharges or booking fees and we also we do not charge you anything extra for paying with a Visa Electron card. The price we quote for your selected Santa Cruz de la Palma ferry ticket, onboard accommodation and vehicle type is all you will pay, and that's a promise! In the unlikely event you find the same all inclusive Santa Cruz de la Palma ferry ticket cheaper in the brochure of any other tour operator we promise that we will do our best to beat that price or offer you the choice of requesting a refund. To book Santa Cruz de la Palma car and passenger ferry tickets please click here. At ferryto.co.uk you are able to obtain live Santa Cruz de la Palma ferry ticket prices, check availability and book car and passenger ferry tickets to and from Santa Cruz de la Palma at our lowest available ticket price. Ferryto.co.uk is part of the world's largest online ferry ticket distribution network providing the ability to book over 80 major European ferry operators including to Santa Cruz de la Palma and to over 1,200 other ferry routes throughout the UK, France, Spain, Ireland, Holland, Eastern Europe, the Mediterranean, the Baltic and North Africa.